Defeat the right in the ballot boxes and in the streets! Pedro Sánchez's term is over. A government of the social democratic 'PSOE' party, formed eight months ago after the vote of no confidence against Rajoy of the traditional right-wing 'PP' party, has been brought down by a vote in parliament against budget proposals. But beyond parliamentary arithmetic, what the early election shows is the complete instability and discredit that corrode the 'Regime of 1978' established after the end of the Franco dictatorship. Its most visible expressions include the mass movement for self-determination and a republic in Catalonia. Also the advance of the extreme right - boosted by the rise of Spanish nationalism and the crisis in the PP. 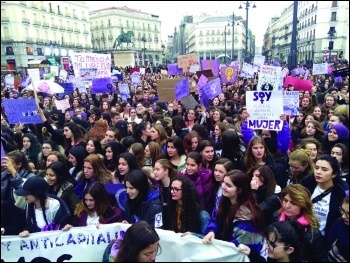 And a social movement with roots in the impoverishment of the population and growing inequality - which does not stop despite all attempts to deactivate it by the union bureaucracies, social democrats, and leadership of the left electoral movement 'Podemos'. We are witnessing a great political polarisation that most analysts cannot ignore. In these circumstances it is worth reflecting on what happened in the 1930 - pointing out, obviously, that we are not in a situation of open revolution and counter-revolution. Today, no matter how much propaganda the supporters of the '78 Regime put out to contradict it, the state apparatus maintains all the authoritarian and reactionary features inherited from the dictatorship. This that has been highlighted once again in its repressive response in confronting working-class struggle. The Bonapartist tendencies of the '78 Regime are shown not only by activating the 'Gagging Law', and trials of left activists, trade unionists and artists for fabricated "crimes" to demobilise and intimidate fighting organisations. But also by what has happened in Catalonia is the best proof of what we are saying - the resounding refusal to recognise the legitimate right of the people of Catalonia to self-determination, plus the unleashing of an unprecedented police and judicial repressive barrage, and the heightening of the most rabid Spanish nationalism. In the 1930s, the revolutionary crisis that swept through Spain's 'Second Republic' was marked by different factors. But the most important of all was the inability of PSOE, in coalition with capitalist republicans, to carry out the social reforms the people longed for. In the context of a profound crisis of Spanish and international capitalism, social democracy failed in its attempt to carry through agrarian reform. The large landowners continued to enjoy absolute power, imposing backwardness and misery on millions of day-labourers. Nor was PSOE able to improve the wages and living conditions of workers. Nor did it confront the economic sabotage of the capitalist class. It renounced separating church from state, and did not end the privileges of the Catholic hierarchy in education and the economy. It remained subservient to the reactionary elements of the army and judiciary, then as now refused to grant Catalonia the right to self-determination, and did not end the colonial occupation of Morocco. The frustration generated by political disillusionment in PSOE fuelled polarisation, and gave rise to seemingly contradictory phenomena. In the first place, there was an electoral triumph for the right, with the reactionary Catholic 'CEDA' party at its head, in November 1933. Then came the October 1934 workers' insurrection against an attempt to establish a fascist state by 'legal' means. Finally, there was the breakup of the capitalist parliamentary regime under the relentless pressure of the class struggle. And the Francoist military coup provoked a revolutionary outburst in republican territory, and a civil war that lasted for three years. Of course, it would be foolish to say we are facing events that are going to repeat themselves along the same lines. Referring to the past is instructive to understand the objective situation, and explain the causes that led to this chronic instability and social and political polarisation that nothing seems to stop. The crisis of Spanish and international capitalism is the material basis of these convulsive political developments. At present, figures show a rapid slowdown in economic growth after years of social catastrophe. More than nine million workers earn less than €800 a month. Among people under the age of 25 who work, it is €600 a month. 90% of contracts signed this year are temporary, and precariousness is like an oil slick that does not leave unaffected any sector of production. Unemployment affects more than 3.5 million people, and the prospect of a new industrial 'restructuring' is just around the corner. The situation is desperate for the majority of the population. Under these conditions it is not possible to expect political stability. There are more than a few capitalist politicians, the traditional right and the social democrats, who yearn for the years of the 'Transition' (after Franco). That is not a surprise! The revolutionary situation of the 1970s was frustrated by the leaderships of the left parties - the 'PCE' ('Communist' Party) and PSOE ('Socialist' Party). They capitulated to the big capitalists and political apparatus of the dictatorship. But democratic conquests were won thanks to the mass mobilisation of the working class and youth, and by the blood of hundreds of fighters murdered by the repressive state forces that enjoyed total impunity. The peculiar capitalist "democracy" created in the heat of that confrontation benefited from the political ebb of the mass movement, the economic boom of the late 1980s and 90s, and substantial aid from the capitalist European Union. The Regime of 1978 achieved an alternation in power between social democracy and the right, with more or less stable governments. The current situation has little in common with those years. The savage offensive against the economic and trade union rights of the working class; the dismantling of the welfare state; the infamous cuts to education and the public healthcare system; the lack of opportunities for young people, except in forced economic exile - all these have created an explosive scenario. From this drastic change in the objective situation following the Great Recession after 2007-08, a social revolt unprecedented since the 1970s has emerged. General strikes. Mass movements such as the Green and White Tides (against attacks on education and healthcare respectively). The Marches for Dignity (against corruption, insecure work and poverty pay). Gamonal (location of a famous victory for struggle against criminal speculation in the city of Burgos). The great student strikes. The mass mobilisations for self-determination and a republic in Catalonia. The remarkable International Women's Day general strike of 8 March 2018. And the large-scale demonstrations by pensioners. The escalation of class struggle - and the shift to the left of broad layers of workers, youth and the impoverished middle class - explains a number of important developments. The emergence of Podemos. The election on 20 December 2015 not leading to the formation of a government, and having to be repeated on 26 June 2016. And, in order for Rajoy to be sworn in as president, the Spanish capitalists carrying out a coup within PSOE to oust Pedro Sánchez (who, as leader, had opposed allowing the PP to form a government). The most ironic thing is that this far-reaching movement - in which the 'socialist' barons, former PSOE leader Felipe González, and the entire 'Prisa' Spanish media squad were involved - failed. Pedro Sánchez was returned as PSOE general secretary, winning against all the odds over Susana Díaz, thanks to the mobilisation of the party's members. Now the situation has taken a new turn. Pedro Sánchez does not have the negative image that Felipe González has among the masses. Nor does he appear as a leader integrated with the most established part of the capitalist oligarchy. The attacks he has received in recent weeks from the right have given him more credibility among parts of the working class than he deserves. The right has accused him of being a 'traitor' to the 'homeland', and branded him head of a present-day 'Popular Front' (the left forces in the Spanish Civil War - for his pacts with Podemos). Something similar is happening with his position on Catalonia. He supported the application of 'Article 155' of the Spanish constitution (allowing the Spanish government to suspend the autonomy of Catalonia) which firmly denies the right to self-determination. He also defended the infamous action of the public prosecutor's office against the imprisoned pro-independence leaders on trial. Despite this, the right considers him the main promoter of "separatism"! Are there not similarities between the political hysteria and the behaviour of the reactionary forces in 2019, with their behaviour in the 1930s? The snap election on 28 April will mean a new escalation in political polarisation. The dilemma presented is evident. Either a government of the reactionary bloc of the PP, the right-populist Ciudadanos party, and the far-right Vox party. Or a possible coalition between PSOE and Podemos, with the parliamentary support of Catalan and Basque nationalists. In these circumstances it would be foolhardy to make a definitive prediction of what may come out of 28 April. PSOE has contributed decisively to demobilising of the left's electoral base - with its policy of continuing cuts and austerity, with its unfulfilled promises, and with its acceptance of the logic of capitalism. But so too have the leaders of Podemos - with their desire to get into government at any cost, abandoning social mobilisation and challenging the capitalist system, mimicking the programme and parliamentary forms of social democracy. But the events in Andalusia (where PSOE was defeated and the far right made gains) and the rise of Vox have had a tremendous impact on the consciousness of millions of workers and young people throughout the Spanish state. Following sure class instincts, right now in the bosom of working families arises the question: can we allow the right to rise and triumph? The answer will be based on an electoral campaign in a very volatile and changing environment. There was a failure of the "patriotic Spanish" mobilisation in Madrid on 10 February, in which the PP, Ciudadanos and Vox were unable to mobilise their social base in the streets. There was the great demonstration in favour of the right to self-determination on Saturday 16 February in Barcelona with more than half a million participants. This explains the enormous social pressure towards the leaders of the capitalist Catalan nationalist PDeCat party, and left-liberal Catalan nationalist ERC party, and their vote against the budget. There were enormous demonstrations for public healthcare in Galicia and Teruel. There were multitudinous demonstrations of pensioners in all regions. There is the great taxi strike in Madrid. And there is what will be a new historic strike day on 8 March 2019, which will fill the streets with millions of women workers and young people from the working class - along with their colleagues, male workers. All this shows the right can be defeated. As for Izquierda Revolucionaria (Revolutionary Left - the Socialist Party's sister party in the Spanish state), we will contribute with all our might to this defeat. But we will not do it to hand a blank cheque to Pedro Sánchez or PSOE - rather, to underline the idea that voting is not enough. We must defeat the right in the ballot boxes, yes. But to defeat the policies of the right, and force the parliamentary left to implement policies which serve the interests of workers and the oppressed, we need to continue the massive mobilisation in the streets. We need also to build a combative left, with strong roots in the workers' movement and trade unions, among youth and students and in social movements, putting forward a programme of breaking with capitalism, for the right of self-determination, and a socialist republic. There is no time to lose! To defeat the right in the ballot boxes and in the streets - join Izquierda Revolucionaria!